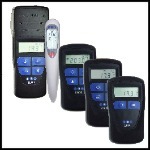 TME manufactures a wide range of digital thermometers. Our products range from HACCP compliant thermocouples for food safety to PT100 thermometers and thermistors. Our Bluetooth enabled thermometers are perfect for wireless temperature monitoring. For great deals, order thermometers that come complete with probes.